1 of 3 Cook pudding with milk according to package directions, 4 to 6 minutes. Cool 30 minutes in refrigerator; stir in yogurt. 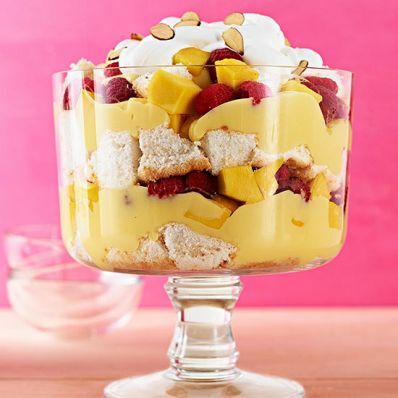 2 of 3 In a 14- to 16-cup footed glass trifle dish, layer 2 cups of the cake cubes, one-third of the pudding mixture, one-third of the mangoes and one-third of the raspberries. Repeat layering twice. Cover and refrigerate overnight. 3 of 3 Whip cream, sugar and vanilla until medium-soft peaks form. Swirl over top of trifle. Top with almonds. Per Serving: 342 mg sodium, 4 g fiber, 7 g pro., 325 kcal cal., 12 g Fat, total, 35 mg chol., 6 g sat. fat, 50 g carb.